1 shared space left. 1 mile to campus. Fully furnished. 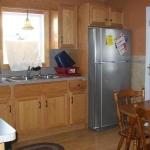 all utilities included; electric, heat, water, cable, internet. Washer and dryer on premises at no extra cost. very quiet and safe residential neighborhood. catch bus behind the house.